Nordstrom | Why Get Dressed? Söfft 'Fiorella' Pump, Dark Purple suede. Also available in grey (and black. Which you do not need). This year, my Nordstrom Anniversary Sale trip was minimalist. In the past I went in with the attitude of, “that’s a great price, I’ll take it.” Sometimes this veers into a “I’m sure I’ll find a use for it, at that price” attitude. These days I’m economizing, set a strict budget, and only wanted purchases that I couldn’t live without. It helps me to approach a sale with the test: “I love it so much I’d pay twice that.” I can make do with what I have as far as pants, suits and extra thingies (bras, scarfs, necklaces). So I was only considering wardrobe-transforming pieces: shoes, maybe a blouse. I bought three things. First, Sofft suede pumps (above). These are so killer comfortable, it’s almost funny. The lady next to me was buying the “Reva” snakeskin-print zippered cage shoe and practically yelling, “It’s that old lady brand! They are so comfortable! Buy these!” If you wear a lot of heels, or (even more importantly) don’t wear heels because because you think they’re always painful — Please go try some of this brand. The heels are not-too-high, but sculpted with angles and curves that make them not-too-clunky. I also liked these Franco Sarto booties. Usually I hate heeled booties. I think they look fine under pants, but on their own they have that creepy “WTF high-heeled ankle-less boot/shoe?” vibe. There’s a wrongness about them. I don’t know if I’ll keep these — I need to try them on with my pants and see how wearable they are. The heel is 3 1/4, which makes a 9-hour workday feel pretty long. But the smoke color is killer and if they work, they would be a major wardrobe upgrade to all my fall/winter pant looks. I spent quite a bit of time with Classiques Entier Tops, I often find really pretty, flattering tops that go well with any a suit and also work well dressing up jeans or cords. I didn’t see much I liked that was on sale: a pretty print in a very difficult shade of green was discounted, but much of the purple line was not. Um, no thanks guys. I can’t do mandarin collar or that faux-tux-front look at all, which ruled out a bunch. (Although now I’m looking at the website and see a lot of stuff I missed — maybe Tacoma had a scant selection? ) 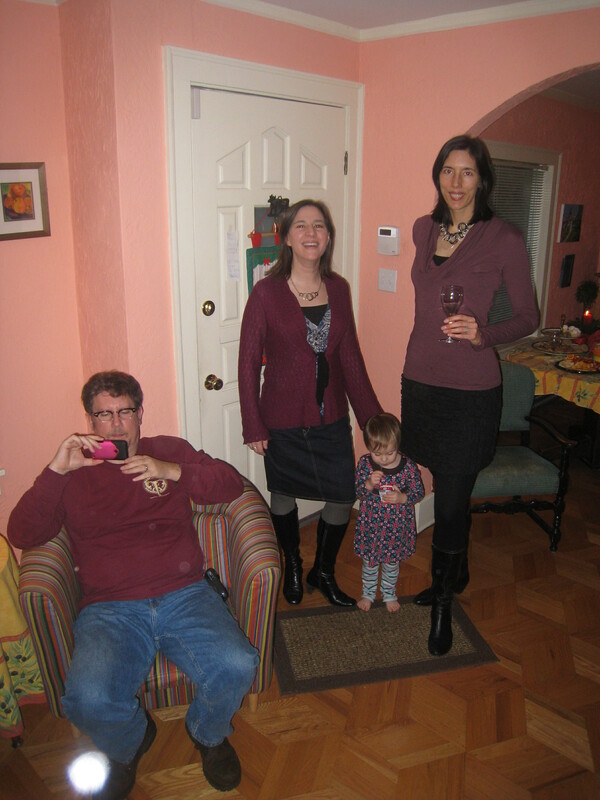 I tried on a puffy cashmere boatneck sweater that was super cozy but made me look like a purple cashmere boat. But the Classiques Atelier line has totally different stuff online than in the store, so I can’t show you a picture. I ended up with one top (picture coming soon). What I didn’t buy: No pants, no leather jackets, no skinny jeans, no batwing tunics. Some jackets were cute, but I’m not in the mood — Seriously I have enough jackets. In a more flush mood I might have considered this plaid Burberry jacket, which I think is hellishly cute. But I have a very similar coat in brown that is four years old and doing just fine. No real incentive to buy the Burberry. There were a ton of gorgeous boots — Mostly tall ones; very, very few short “Little Black Boot” types. I will post the Julie and Jennie report soon and we can talk about what a person wears the boots with (skinny jeans? Does that require tunics? Can you just tuck regular jeans into the boots?) I might go back and see how I feel on a different day (I need to take my kid to get the right size shoes — this is the only time we buy Geox for boys). For now, I’m happy with the minimalist thing. Anyone else? What can Nordstrom do for you? I’m a little burnt out from baring the raw core of my soul about what Bella wears in Twilight. But, I must post to remind everyone that the Nordstrom Half-Yearly Women’s and Children’s Sale starts today. This happens twice a year. Go tonight! I’m serious. It’s a clearance, so everything sells out quick. -Kids stuff (girls department usually has Pumpkin Patch and Tea brands on sale, and Geox shoes are a big discount too). Most importantly, I am going to skip the Half-yearly Sale this year so SOMEBODY else needs to go and write about it. I am burnt out dudes, my baby is refusing to fall asleep until 10 pm and we’re trying to save up money for a trip to California. And I might — just might — have all the clothes I need for now. Classiques Entier ruched mesh top. Great under-bust seams. Mine is a purple and black watercolor print. It’s still summer, but today is a rainy August Tuesday and it feels like fall. If you live in Homer, Alaska, like my sister, it IS fall. They are even back to school already (don’t feel too sorry for her! They end in May. Like the Semester System! Which I have never been on). Classiques Entier® offers sophisticated designs and well-constructed essentials in luxurious European fabrics. The collection features versatile styles and current trends interpreted for the workplace. The effect is confident, stylish and feminine—with a touch of glamour. Classiques Entier Atelier provides polished, feminine suiting and elegant separates to build a timeless wardrobe. Expertly crafted from European fabrics, the collection offers essential items as well as luxurious pieces to create standout looks. That sounds pretty pretentious but I get it. I have this in brown and it’s my favorite top! Look, I found it in blue. Bad news: someone put my brown one in the dryer. EEEK. It might have been me. It kind of shrunk and I kind of cried, and my 4-and-a-half year old son (who cheers me up from crying FAR too often) tried to reassure me by saying “You can buy a new one, Mommy!” I don’t know. Classiques Entier feature outfit: "Shard" print belted silk dress, long cardigan, tights, open toe boots. Hmm. I flirt with Jennie's coat, but don't take it home. TGIM! Don’t miss our excellent weekend posts by Deathmama on her latest thrift adventure and from Guest Author Meg on her Cowgirl Shopping Venture . Some comments raised some Nordstrom questions so here is more Nordstrom FAQ. Department info is at the official list of Nordstrom Departments . Also, read the You look Fab summary for more detail and brand names. Here are my additional Department tips. Point of View: Start here if you’re new. It’s “round the Clock” and “accessible.” This means lower prices (comparable to Macy’s) and more conservative (Meaning, not crazy risk-taking fashion. Not meaning Barbara Bush). Semantiks is their careerwear brand and Caslon is the casual wear. Great casual and business casual options, good mid-price ($50-$110) jeans. Many items come in a variety of colors, all of similar palettes so pretty much everything can be mix-and-matched. Lots of cute cardigans and yes, some hoodies. Individualist: “Career and Casual Fashion with contemporary appeal.” This is the upper price point department, where they sell Nordstrom Classiques Entier, the other house brand. Their clothes include suits with a more current design (my coworkers call them “WOW! Cute! Suit!”) Fashion-forward prints, more silk, nicer fiber blends and finer tailoring. Savvy: “The hottest names and hottest trends when they happen.” When I was a teenager, I asked the Brass Plum salesgirl where she got her cute skirt, and she said “I got it at SAVVY. SAVVY clothes stay in style for a long time, because they are ahead when you buy them.” Since then I’ve been fascinated with Savvy but a little intimidated. Now I try to visit it every time I go, not to buy but to reflect Whats In, try it on and think honestly about it — kind of like I do with Vogue. t.b.d. is designer denim and its accoutrement, like expensive t-shirts with dragons on them. Also, leather. Narrative: “Effortless” and “work, play, evening, day.” Also: “roomier.” I never find much to like there and I suspect it’s for older women, or maybe Kindergarden teachers. You Look Fab suggests always cruising through for sale items, but I don’t have the patience. Encore is Sized 14-24; Petite Focus is for people under 5’4, or those of us with short legs who are lazy with hemming. Couture, Via C (new designers) Studio 121 (old rich lady: “luxe”) and St. John (Sarah Palin suits) don’t really fit my lifestyle much, but can be fun to check out. Don’t forget Lingerie, they carry Betsey Johnson and a few other brands that are hard to find locally, and their sale racks are full of discounted Wacoal (a favorite of both your blog hostesses). Women’s Shoes. This is where you all should shop for shoes, period*. I want sum up by saying “I’m not some kind of Nordstrom DIVA,” but I remebered I’ve decided to be “unapologetic” about it. I know my loyaly is a hometown thing, since Nordstrom is local. But I have lived in the Real Big City and I can tell you that yes, Nordstrom rates with Bloomingdales, Neiman Marcus and Saks. Nordstrom has premium service, including an unbeatable return policy. If your feet are two different sizes, Nordstrom will split a pair of shoes for you without charge. Yes, this is built into the pricing, so you pay; and there aren’t the bargain-basement styles sales you get at a place like Macy’s. But good sales do happen, and the clearance racks are well-stocked. Three shoes I liked, but they didn't have my size in the color I wanted. They offerred to call around to other stores until they found the ones at another store and send them to me at my house for no charge. If you haven’t been shopping for awhile, I really do recommend Nordstrom. It’s so nice to be in a well-vacuumed dressing room and have some experienced help. They understand about building loyal clientele and will not hate you if you don’t buy anything. In fact, they will happily hold something for you for a few hours while you go look around the mall. I do do this when I’m tempted to buy something out of guilt — go take a break. If you change your mind once you leave the store, they’ll just wait a few hours and then put the item back on the floor. I’d love it if everyone went to to Nordstrom and came back to report. Preferably with photos! *I know, this kind of mandate has distasteful socioeconomic and cultural implications. I think sacrificed that conscientiousness when I first presumed to give fashion advice. Anyway, go shop for shoes there, and then come back and tell me I’m wrong. Flagship Nordstrom, downtown Seattle: No place like it on earth. Raise your hand if you remember it as Frederick & Nelson’s! Q: What could a fashion blogger possibly enjoy more than an afternoon of shopping alone at Nordstrom? A: An afternoon of shopping with a friend. Why can't I breathe? This says it should fit me. Ahem. Friends understand if you don’t really need to buy anything today. Except a dress in case you decide to start going to the opera. Friends nicely suggest you turn around for the picture because the back view doesn’t look as bad. We all know it doesn’t fit and I’ll never buy it so this is just for educational purposes. Purple color was even more stunning in person. We agree we would be a perfect pair of bridesmaids, if only we had mutual single friends get married sometime soon. Any ideas? Sometimes things are so cute on the hanger, and just don’t fit, so you have to let them go. Cute pink plaid, fit so sad. I try on Jennie’s jacket, which apparently I think is hilarious so I laugh like a dork which absolutely defeats any chance I have a pulling it off. Looks great on Jennie! Not me so much. Aki is tempted to reconsider her “no collars! No buttons!” rule. Because this is super cute, and super YOU. Via C glitter skirt. Attn JvA re backsplash! I bought one of the purple dresses and returned my NAS over-purchases. I decided I didn’t the Mom sweater, a top that I got in multiple colors that I’m less excited about now, and a halter dress for Baby C that was way too Hannah Montana for a 2 year old. We went to Anthropologie and apply ourselves to finding non-hoodie cardigans. Aki starts to like the micro-fine gauge knit sweaters. Some are pretty cool. Some are so cool we can’t figure out how to put them on or whether to tie them. Anthropologie is like that, isn’t it. Some are almost cool, or maybe we are getting confused and can’t tell. Beautiful ruffled berry color: Too fancy? Gray belted pleat cardigan: Too bathrobey? Loved this, absolutely bewitching print and color. But slightly weird short sleeves and too stocky in the torso. Beautiful, but for $168 I require perfection. Good reason not to shop alone! Hey I look fantastic . . . ! “hmmm, Robin, do you want to check out the side view? No really, look at this picture I just took.” Oops, clingy fabric = bad bulge bra strap action. Sad! As a grande finale, we ran through BCBGMaxAzria in Pacific Place on the way back to our cars. I found this for 70% off. . . same print as the robot dress! Whether our single friends should all just marry each other. Stay tuned for upcoming blog posts on these and other exciting topics! Be sure to swing by and comment on what you see. Otherwise we can’t ever know how other people perceive us. Looking for a hand-painted dog statue? Watch for this to go on sale! Right now it’s $890. Left, New Tacoma Mall Nordstrom; Right, Empty dinosaur of old Nordstrom. After weeks of yammering about it and listening to other people’s shopping stories, today was my day to hit the Nordstrom Anniversary Sale. I almost skipped it. The nearest Nstrom is 30 miles and 30 minutes (on a good Freeway day) from my house, and life is busy. But I convinced myself it was worth the trip to get an entire fall/winter wardrobe at 50% off. I wear “work clothes” 5 days a week, 50 weeks a year — having clothes that fit and keep me comfortable is usually what gets me out of bed in the morning. And wearing pretty clothes that I love is one of my big motivators for going to work in the first place. It’s a hot July day, so most of Western Washington was outdoors enjoying summer paradise like a sane person and not shopping for fall clothes. So I got a good parking space, plenty of empty dressing rooms, and lots of personal attention. And air conditioning, yay. I stopped at the Toddler Girls’ section on my way in. I found Baby C a winter coat, winter sweatshirt, and a few long-sleeve T’s at 30-50% off; The kids section has Columbia sportswear, Tea, Pumpkin Patch, and what might be Juicy Baby but I don’t even want to know. They carry a brand called Twirls & Twigs that I haven’t seen before which are bamboo fiber and recycled fabric originals. I will post pictures soon, this stuff is worth finding (on sale). I tend to over-purchase in situations like this. I tried to be as critical as possible about the clothes. When I start rationalizing, like “this wouldn’t be too bad in a pinch,” I forced myself to ask, “If I bought this now, would I look forward to wearing it on Monday? ” Or the first Monday it’s below 70 degrees, anyway. Sale prices distort my decision-making so I try not to look at them until the end. “That’s worth buying for $29” is a big no-no – so I have a “half-again” rule: Would it be worth buying for $45? Classiques Entire wrap top with side-ruching; Semantiks tweedy trousers. All pants are too long for me. The Classiques Entier tops were a thrill — perfect fit and great price. I got multiple colors because these things are going to rock in the winter, under suits or cardigans (but will still look cute on their own). I tried on a cute BCBG Maz Azria wrap top with a kind of crazy print. The wrap style is really working on me, but the waist tie was too fussy. Ultimately this one didn’t make the cut — I had too many things I liked better to fit into the budget. Time for the Cute Little Print tops. I love a bright print top with an otherwise conservative outfit (like a suit), so I wanted to find a few. Point of View has a whole mess of these on sale, organized by size. A lot of these are Sweet Pea brand. The prices are competitive but they are a meshy nylon with raw edges and the fit is really iffy and they can scratch, too. I tried a bunch on, trying to focus on shape more than print. Point of View nylon tops. Don’t think too hard about prints . . . just keep going. Ah. Feels so nice to cover the tum in some drapy, lettuce-edged layers. Wait, am I wearing green? Time for the leather jacket . . .
And then quickly panicked and went back to my comfort zone: cardigans . . .
Black leather no, brown cable hoodie sweater yes. Comfort zone, whew! Liked the detail on this cardigan but it didn't totally work. For the record this is the best my hair has ever looked in my life. Raspberry crochet cardigan with black ribbon tie -- Smile! You love this one! I loved this and I bought it. Beautiful knit, interesting stripes, good back detail for a cardigan -- love sweaters like this sitting at my desk all winter, only problem is . . .
. . . This could be picture of my Mom. FOR REAL. I love my mom but this isn’t what I was going for. I think I might give this to my mom. A NAS Featured Item: Blue Ponte knit. Really fascinating dress, doesn't quite work -- the cut fights me at too many places. BCBG brown knit . . . didn't even need to try it on, I was so sure it would be perfect. I bought it, but kind of wish it was a different color. This is my third brown work dress. Gray Calvin Klein. As you can see I'm debating it. The sleeves have "sweet" bows that I liked. It matches a suit jacket I have that's actually a different brand. For $80 I brought it home but I still might return it. I don't like this, I don't even want to like it. This dress made me sad. And some casual stuff . . . These cords made me happy. Hunter green Christopher Blue Bootcuts, 45% OFF DUDES. Why I don't wear crewnecks. Love this except the bust is going to fit even worse after that goes through the dryer. It took maybe an hour to get through it all, with the help of the saleswoman running back for other colors. I didn’t really need her to run back for other sizes, since I knew what would fit my shoulders in those brands, and everything else is cut. If I go up a size to fit where it’s tight, it’s not going to work somewhere else., and I might as well just narrow it down. I got rid of a lot of “No’s,” including a few things I didn’t get pictures of. I also found a perfect pair of jeans that I didn’t photograph at the time but stay tuned, I’ll be wearing those suckers all winter. I hauled everything out to be rung up, took the bras I liked over to Intimates to grab matching bottoms. I think I sorted out a few more things at the register because I knew I was going over budget. The air conditioning must have been getting to me. You know what I love? They have stools at the counter so you can sit down and drink the rest of your Diet Pepsi while they ring you up. They also helped me carry everything to the car. Then it was to shoes. Long story short (too late!) 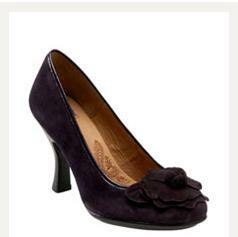 I found the purple suede flats (pic below) which were an easy Yes. I liked a bunch of heels, they didn’t have any of the colors I liked in my size. They offered to order, but then I found The Boots. I’m falling asleep, my laptop broke and it’s 90 degrees in my house so I can’t post a picture right now . . . but let’s just say, the Cole Haan Air pumps that I love so much I married them and take pictures of them at every opportunity? These are those, but boots, stacked heel, Nappa leather, and Chocolate brown, but I swear it looks like a beautiful dark gray or maybe taupe. Or maybe I’m just exhausted. Anyway these boots are my new boyfriend, and they demand that I’m monogamous (okay this metaphor isn’t working, but the point is $1 boots = $three shoes so I didn’t get other shoes). Then I rushed out: Swung through Toddlers to sort and pay for the stuff I wanted for Baby C. Tried to look at handbags and hosiery but dude, if you are tired of reading this, believe me I was tired of doing it, so I gave up. I had no idea at that point whether I even needed a purse or not. 30 miles home – this time with bad traffic and lots of Cheezits. Got home, got approval from the Marital Community for the Baby C clothes, and started trying to model a few outfits before I gave up in the heat and went for my last Mike’s Hard Lemonade instead. Summary: Two trousers, two dresses, quite a few cute tops mostly long-sleeved. Three cardigans. 1 ea jeans and cords. No biker jacket; Amazing boots. Part of me feels like apologizing or explaining for buying so much stuff – but as I’ve said before, know what you can and will spend on clothes and it’s not about explaining why (to yourself or anyone else). We won’t see much of my new stuff during the summer, but come fall I will definitely have a closetfull of good stuff to get me out of bed on those cold dark mornings – and hopefully keep me out of the Target Women’s Department scrambling to put together outfits the minute the weather turns. Either way, I’ll let you know.